Our Science and Engineering students come from a range of academic and personal backgrounds, and end up in a diverse range of positions. Read below about the dynamic experiences and opportunities a selection of our current students and graduates are undertaking. When I went snorkelling for the first time...I put my head in the water with my mask on and saw this explosion of colour and fish, I was absolutely hooked. I needed to know more. It was then I truly found what I was passionate about. I was able to talk about my volunteering experience in my [job] interview, and it really impressed my employers. I deal with a huge spectrum of different people at work, so it’s been incredibly helpful to have that experience. Scientist Jamie Bridson is researching how we can use biological materials from the forestry industry to create new environmentally friendly products such as biodegradable plastics. Annette flew to Scott Base to begin her research in her version of paradise. She spent a week in Antarctica, flying by helicopter to nine different sites to collect soil climate data. Hearing heart-warming pregnancy success stories from her patients is the ultimate reward for Catherine Charleson, who works in a Hamilton fertility clinic as a clinical embryologist. Alice's research background is in stem cells and she works for renowned plastic surgeon and medical researcher Dr Swee Tan. Monique has fond memories of all the practical, hands-on experience that was a big part of her degree, with the Bay of Plenty providing the perfect environment for the marine and freshwater related component in particular. Andrea Dekrout's job tackles two of the biggest issues the world is worried about right now - the refugee crisis and environmental conservation. For engineering graduate Rene Engelbrecht, her first year out of university has been a busy and exciting one. I'm spending one year with the British Geological Survey, working in the Inorganic Geochemistry Laboratories in Nottingham. Science can be one of the most hands-on fields to work in, and Waikato’s degree nurtures that. I’m so grateful that I chose this path because thanks to Waikato, I discovered my passion for research. I always knew that Waikato has fantastic opportunities for scholarships, and the beautiful campus was the icing on the cake. Doing CUP was definitely one of the best decisions I’ve made. For Waikato graduate Dylan Harrison, a career in science has always been on the cards. Since 2013 Leon has been a research associate at Cambridge University, working in an automotive engineering capacity on a project funded by Volvo Trucks. Although Laura Hines says that University is not just about the learning, she did a lot of it while she was at the University of Waikato. Master of Engineering (ME) student Pinwei Jin has designed and built a remote control robotic snake, which he hopes will be used in the future for rescue operations. A six-month exchange to Canada, a handful of scholarships and excellent support from lecturers were just a few of the things that made study at Waikato an experience of a lifetime for graduate Catherine Kirby. Over summer I worked in a lab where I used X-Ray Fluorescence Spectroscopy to undertake chemical analyses of rock samples. For Riki Lewis, studying Earth Sciences at Waikato has led to an exciting job as a Soil Scientist with the Queensland Government. I selected Waikato University because of the excellent reputation of the Coastal Marine Group's research and staff, great relationships with industry, and a huge selection of field survey equipment and the technicians and capabilities to use it. Dr Low graduated from Waikato with a doctorate in 2012. He works at Ligar, a company based at Ruakura in Hamilton that specialises in commercial filtration to extract organic and inorganic molecules. I’m in a lab the same amount of time, if not more than I’m in lectures each week, which really helps me retain the information I’m learning. Victoria McCullough chose engineering because she wanted to study towards a career that was both academic and practical. I really like the community feel here at Waikato. It’s easy to make connections and develop relationships with people. For electronic engineering honours graduate Kirsten Nel, the University of Waikato was her first choice because of glowing reviews from current students. For engineering masters student Mahonri Owen, the drive to help others led him to undertake one of the most complex research projects – to design and create a brain-controlled electro-mechanical prosthetic hand. I chose Waikato because I knew I would get the chance to explore untapped areas of existing technologies and enable them for use in future projects. Sanjay Patel found his passion in chemistry and finance at the University of Waikato after deciding an Otago health sciences degree wasn’t for him. Choosing to undertake tertiary study is a big decision, and not one that engineering student Tom Petchell took lightly. Jonathan specialises in analytical biochemistry and uses analytical techniques to understand the biochemistry of cyanobacteria and algae. Jonno is testing soils’ composition and capacity to hold water against the needs of the different crops and analysing satellite images to map frosts in each area. Waikato Biological Sciences graduate Stewart Robertson has used his scientific knowledge and entrepreneurial vision to create an idyllic lifestyle for himself as an owner/operator conservation tour guide in the Abel Tasman National Park. It’s cool being able to do both sides of engineering. I really like spending time on the computer designing, but then also doing the hands-on side. St Paul’s student, Chris Wakefield, has been passionate about Chemistry and Biology from a young age so his decision to enroll in Waikato’s Bachelor of Science (Technology) with a biochemistry major was relatively straight-forward. A PhD focused on increasing the energy efficiency of milk powder production has led University of Waikato engineering graduate Tim Walmsley to a full-time job with the very research group within which he worked as a PhD candidate. This role combines my technical knowledge and people skills to connect with customers throughout the world. Passionate to make a difference after seeing inadequate animal living conditions in Japanese zoos, Ashleigh Weatherall chose to pursue a Bachelor of Science (Tech) at the University of Waikato. I absolutely loved my placement at the Otorohanga Kiwi House, where I was a keeper and raised eight baby kiwi chicks. The knowledge I gained through my studies, and the opportunities I was given with my placements, were the foot in the door into the industry. 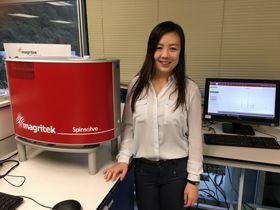 A passion for chemistry has led Cody Wright to an exciting position with New Zealand’s leading analytical testing laboratory.